"Israel and California agriculture face similar challenges, including drought and climate change," said Doug Parker, director of UC ANR’s California Institute for Water Resources. 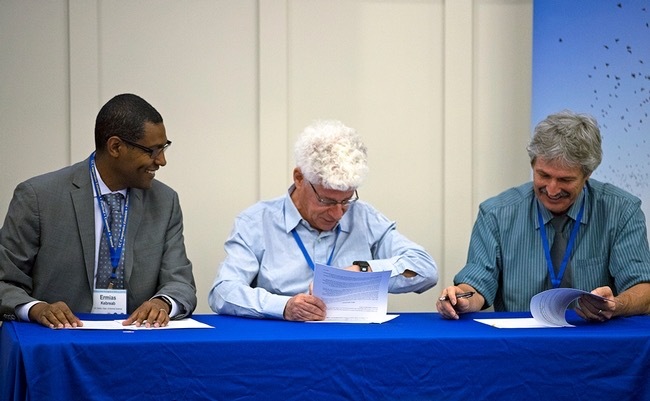 "In the memorandum of understanding, Israel’s Agricultural Research Organization, UC Davis and UC ANR pledge to work together more on research involving water, irrigation, technology and related topics that are important to both water-deficit countries." "It’s a huge pleasure for us to sign an MOU with the world leaders in agricultural research like UC Davis and UC ANR," said Eli Feinerman, director of Agricultural Research Organization of Israel. "When good people, smart people collaborate, the sky is the limit." "The important thing is to keep working together and develop additional frameworks that can bring the people of California and Israel together as researchers," Kofman said. "But also to work together to make the world a better place." Ross said, "It’s so important for us to find ways and create forums to work together because water is the issue in this century and will continue to be." "Over 700,000 people are at risk of relocation due to water scarcity," Ross said. "We’re already seeing the refugee issues that are starting to happen because of drought, food insecurity and the lack of water." Ross touted the progress stemming from CDFA’s Healthy Soils Program to promote healthy soils on California's farmlands and ranchlands and SWEEP, the State Water Efficiency and Enhancement Program, which has provided California farmers $62.7 million in grants for irrigation systems that reduce greenhouse gases and save water on agricultural operations. "We need the answers of best practices that come from academia, through demonstration projects so that our farmers know what will really work," Ross said. As Parker opened the water workshop, sponsored by the U.S./Israel Binational Agricultural Research and Development (BARD) Program, Israel Agricultural Research Organization and UC ANR, he told the scientists, "The goal of this workshop is really to be creating new partnerships, meeting new people, networking and finding ways to work together in California with Israel, in Israel, with other parts of the world as well." Drawing on current events, Bell told the attendees, "If you look at the World Cup, it’s about effort, it’s about teamwork, it’s about diversity of skills, and I think that’s what this event does. It brings together those things."